Bright blue Easter bunny button badge. 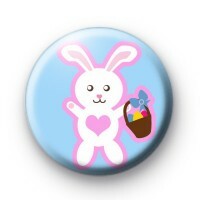 This Easter-themed badge has a white rabbit with a pink love heart and a basket of colourful Easter eggs. This is the perfect little extra gift to add to an Easter Basket or use as an alternative to chocolate. We have so many fun, bright easter badges to pick from. Including so many adorable Easter bunny designs, cute yellow Easter chicks and a lot of fun Easter slogans. Why not use them in your Easter egg hunt this year!